I really can’t remember the first time I went to Jacala Mexican Restaurant. There are probably a lot of residents of San Antonio who can’t remember either. What they probably do remember is that they can’t remember a time NOT going. Jacala has been around since 1949 and boasts that it is the oldest originally owned restaurant in San Antonio. I don’t think I have ever gone to the restaurant and not seen one of the owners there, greeting and seating. Jacala is one of those restaurants that has withstood the test of time, whose patrons bring their children and grandchildren to enjoy the food. Granted, in my opinion, Jacala does not serve the most delicious and outstanding Mexican food in town. What they do serve is consistently good food at a good price. Even with long lines, you won’t wait long before you are seated. Restaurants serving poor food do not stick around as long as Jacala has. That, in and of itself, should be reason enough to check it out. I recently went to Jacala with my family, my parents, and two second cousins, one of whom will be moving to San Antonio soon. One of my cousins, Carlos, had the guts to try the chicken enchiladas with mole sauce. Mole, to the uninitiated, can be a daunting dish. Made poorly, and you will forever swear off Mexican cuisine. Made well, and mole is an extremely complex sauce (Rick Bayless has an excellent description here). Although its base is stock (normally chicken), chili paste (usually from a non-spicy pepper like a pasilla), and bitter chocolate, most recipes can include upwards of 20 other spices and ingredients. In general, the mole flavor is pungent and sweet (like chocolate and raisins) all at the same time. Everyone has a different recipe for mole, some good, some bad. This one was good (not great, but good). Carlos loved it, and I respect anyone who will at least try something new (heck, he didn’t even know what an enchilada was). The gorditas here are pretty good. 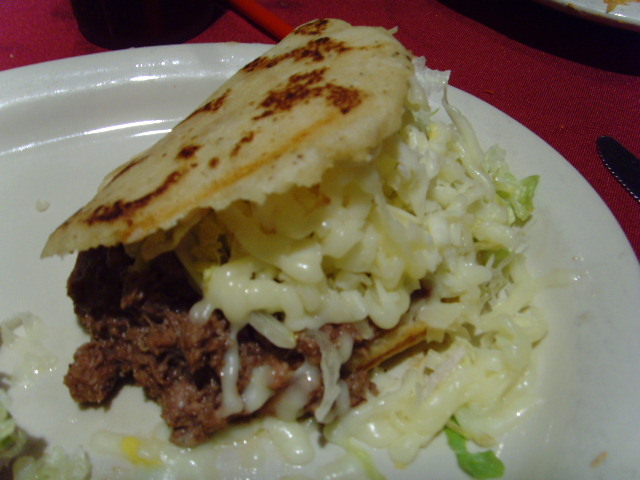 The masa (or dough) is not overly grease-laden and the ground beef is not undercooked (which is a pretty common way many restaurants save money by not allowing so much shrinkage). They come two to a plate and are about 5-6 inches in diameter. As you can see by the picture, they are fairly messy to eat. The puffy tacos, although a little small, are pretty tasty. And the enchiladas, whether smothered in cheese, or topped with green sauce or mole, are pretty good. Personally, I can’t get enough of the table sauce. If you can’t either, you should be able to find a jar with the restaurant’s name on it at your local grocer (assuming you live in San Antonio). If you have not checked out Jacala, I would recommend that you at least drop in to see why the rest of San Antonio loves this place. There are a lot of lame oriental restaurants in town. You know what I’m talking about – you’ve eaten at them. Spice Asian Bistro is not one of those. I’ve eaten there twice and been happy both times. For the most part, the menu is comprised of Thai dishes. There is also a comprehensive sushi menu as well as a few Chinese dishes as well. However, I went for the Thai food. To be clear, I am not one of those newspaper food critics that goes in to an establishment with three other people who order and share numerous appetizers, entrees, and desserts…and again on a second or even third visit. On the other hand, I’m just a regular joe who can afford to eat out on a not-so-frequent basis. So, my wife and I order two entrees, and maybe an appetizer as well. However, those two entrees should be emblematic of the restaurant as a whole. If the food I’ve ordered is made well and tastes great, I can be fairly confident to expect the rest of the food to be just as satisfying. My wife and I are not into the club scene at all. We do enjoy an occasional drink, but don’t enjoy the places that normally serve them as they cater to decadent youth focused on competitive imbibing. Not so with Zinc, located in the heart of downtown San Antonio within a short walk of the Riverwalk or the Alamo. This place has a more elegant and upscale feel than many other places do. The clientele seems different, too. At least when I’ve visited, the patrons are more subdued, enjoying the company of a small group of friends. Although the tv’s are usually showing a game, the volume is normally muted so as not to compete with the music or conversation. This is not the type of place you will need to raise your voice at to be heard. The menu is lengthy with a good selection of wines, spirits, and specialty mixed drinks. Although I’ve never had their food, they also offer panini’s, pizza’s, and a couple of desserts as well. There is ample seating in the main bar area, as well as the adjoining lounge. On nice evenings, the outdoor courtyard is an excellent place to relax. If you want to get away from the ordinary and step into a relaxing, adult environment, make sure to visit Zinc. I wish I had gotten the jump on San Antonio’s Express News review of Boudro’s, but sometimes life gets too busy and things go by the wayside. However, I have pictures! Here’s my two cents on a recent visit. Whereas the writer of that article did not mind being shoehorned into her table, that is the first thing I noticed when my wife and I met my parents and my aunt and uncle at Boudro’s this past weekend. I expected this upscale restaurant to be crowded (this is on San Antonio’s Riverwalk, after all), but I’ve never seen a more worthy attempt at cramming tables and chairs into such tight spots. The small table couldn’t hold all of our dishes at once, the guacamole cart just would not fit between my uncle’s chair and our neighbor, and I think I actually rubbed hair with the person sitting behind me several times. Yes, it was also loud, but you sit so close to your tablemates that it doesn’t really matter. Cappy’s restaurant was opened in 1977 by Cappy and Suzy Lawton as one of the first establishments intended to revitalize the Alamo Heights area of San Antonio. Alamo Heights is an older, more affluent neighborhood that is a beautiful place to live and work. In 1996, the Lawton’s opened Cappyccino’s (“Little Cappy’s”) as an adjunct and complement to the popular and successful first restaurant. Its just across the patio from Cappy’s and offers quick and light fare. It is probably one of just a handful of full bars in San Antonio that is completely smoke-free and is a great informal place to meet for lunch, as is evidenced by the mix of casually attired as well as business-suited clientele. There’s a new feature on this site: San Antonio Restaurant Menus. Use this guide to San Antonio’s best (or worst) restaurants and their menus by clicking on the link here, or choosing the San Antonio Menu page/tab above. I’ve organized it by Cuisine Category to make things as easy as possible to find. If you don’t find what you are looking for, leave a comment and I will add the menu if it is available. You name it, its here. Thanks for looking. I decided to check out the Shisha Cafe this weekend because I was in the mood for something different and inexpensive. After looking through the local paper’s top dining picks for Middle Eastern fare, Shisha Cafe fit the bill and was close to where I work. The cafe occupies a small spot at the end of a strip center and has indoor and outdoor seating. Despite its name, however, I am inclined to report that this place is more of a lounge or parlor rather than a cafe, and I will have to respectfully disagree with the Express News’ assessment that the fare is worth investigating. “Shisha” is the Arabic term for what many know and refer to as a “hooka” pipe. And as the name implies, the focus of the cafe is indeed smoking (“oh, and by the way, we serve food”). Evidence of this fact became more apparent as my family took a seat inside on plastic patio furniture and torn rattan tables. Thank goodness the music is kept at an acceptable level because I can only take so much of watching overly-produced Persian music videos featuring Western looking people singing in Guiness record-breaking tone and voice modulations. Popular American board games await on a shelf at the front counter for patrons to pass their time until the place closes at 4am. Rather than visiting a restaurant, the large bong (oops, I mean water pipe) assortment made it seem like I had entered a reincarnation of a “Magic Habits” head shop sans rock music, glow in the dark posters, and age limit warning signs.